Left to right: Family Fund’s Chairman, Ian Black; Managing Director of Family Fund Business Services, Jill Wheeler and Family Fund’s CEO, Cheryl Ward with the Charity Award for Grantmaking and Funding. 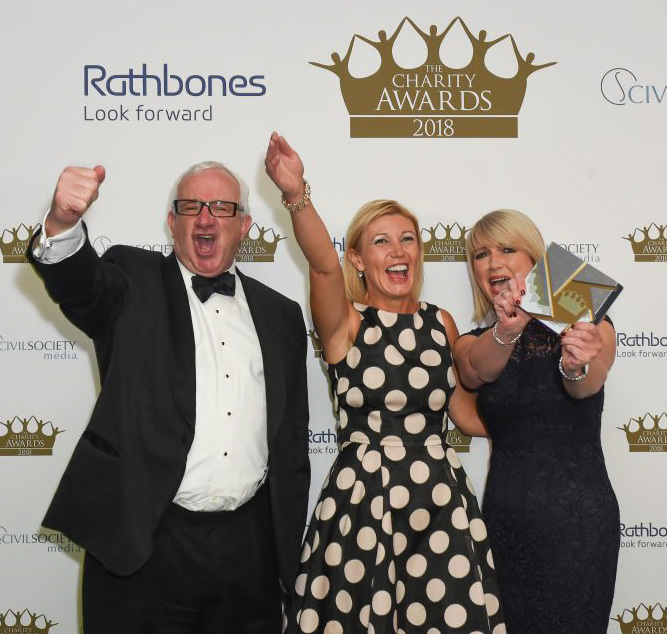 Family Fund Business Services (FFBS) are thrilled for their parent charity, Family Fund, who won the Grantmaking and Funding category at the Charity Awards 2018 for their work establishing FFBS. Since its inception, FFBS has raised £2.9 million to fund Family Fund’s work supporting families raising disabled or seriously ill children and young people. FFBS uses Family Fund’s expertise in grant-making to provide fulfilment services for public and third sector organisations, with all profits going to Family Fund. Not only does this increase the number of grants Family Fund can offer, but also diversifies Family Fund’s income, further securing their future. Their fellow nominees also showcased a wide range of achievements including Islington Giving, for their place-based giving model, and Trust for London for establishing the Strategic Legal Fund for Vulnerable Young Migrants. Click here to find out more about our services and how we help organisations, help others. This entry was posted in Charities, Events and tagged Award, Charity Awards, Family Fund, Grantmaking and Funding, Winner. Bookmark the permalink.